“A rose by any other name would smell as sweet”… a famous Shakespearean quote from Romeo and Juliet. What has that got to do with drums you ask? I know I am beginning to sound like a “One Note Samba". As noted in my last NSMD submission, I am no Ludwig expert BUT it occurs to me that a commonly used reference of “transition badge” is, in fact, a misnomer. The badge above on the left has the reigning title, but the one on the right smells sweeter to me. 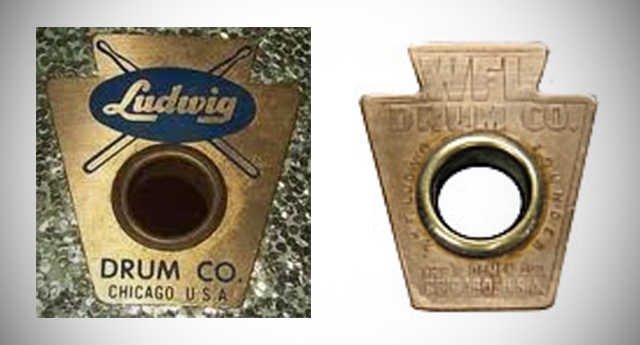 A little history…The Ludwig & Ludwig Drum Company was founded in the spring of 1909 by brothers William F. and Theobald Ludwig, manufacturing a bass drum pedal. Crude pedals of the day were “…not powerful or fast enough for the fast rag-time tempos” and the new Ludwig creation became an immediate success. So much so that the brothers began spending more time manufacturing rather than playing drums. That is, until Theobald fell victim to the great Flu Epidemic in 1918 and died at a young age of 29. By demand, William F. took over and devoted 100% of his professional career to manufacturing. 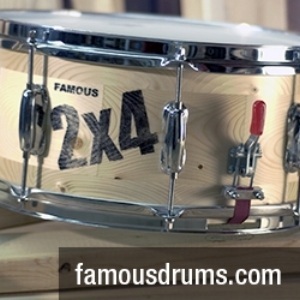 Ludwig & Ludwig became the world’s largest drum company in the 1920’s, surpassing Leedy Drums. World War I put a damper on all non-war related manufacturing, but Ludwig was awarded a substantial contract from the US Government for rope tensioned drums and the company continued. After the war, returning musicians were in-demand for theater orchestras and Ludwig’s success flourished. Conn was quick to notice and had their attorneys file for trademark infringement (Conn owned the Ludwig name). 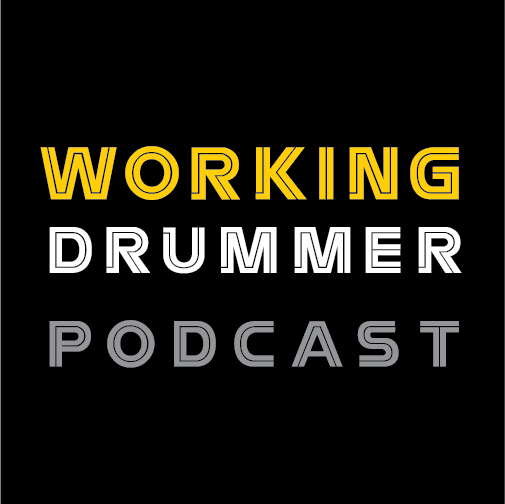 Ludwig Sr. was forced to change the company name to WFL Drum Company. Knowing the brand recognition of the Ludwig name, he wisely inscribed his logo badges to include “Wm. F. Ludwig, Founder”. Conn was enraged but Ludwig was totally within his right, a totally legal procedure." That same year WFL offered a new catalogue with Buddy Rich proudly displayed on the cover and a WFL badge that still contained Wm. F. Ludwig, Founder at the bottom. The drums produced at this time however (with some exceptions) had badges that were stamped “WFL” at the top and “Ludwig Drum Co Chicago USA” at the bottom. The 1957 catalogue includes a WFL badge with this “Ludwig Drum Co. Chicago USA” inscription at the bottom. 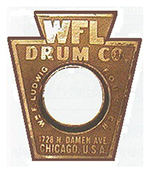 This continued until 1958 (I have seen 1958 date-stamped WFL drums with this badge). 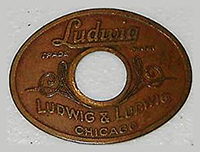 Then about 1959 the so-called “transition stamp” badge appeared with “Ludwig” at the top and “Drum Company” at the bottom. My question is, why is this the “transition badge” when the prior badge was emblazoned with “WFL” and Ludwig”? Isn’t that clearly the transition? When both names are included after the acquisition from Conn in 1955? I clearly remember in 1956 (see the April 2013 NSMD article “Taking the Driver’s Seat Of A Time Machine”) when the proprietor of Ballou’s Drum Shop in Dayton, Ohio, where my parents bought my set of WFL’s exclaimed, “Those drums are now being made by the Ludwig family.” It was a big deal at the time. My take on it is, Ludwig was a great promoter. He also knew the value of brand recognition. After building the Ludwig name, only to have it taken away, he again built the WFL name (with the help of including his name as the founder). After seeing the Ludwig name denigrated by poor decisions and marketing by the Conn Company, he realized a quick name switch from WFL to Ludwig was definitely not in order. Though he was ecstatic to “own his own name once more!”, he wisely made the badge transition over a three year period that included both the WFL and Ludwig names. I know there are those that will fall back on the “they used whatever was available” theory. There is validity to that theory when applying it to parts like footboards and throw offs…sure, use up the remaining old logo parts but badges? This is the hallmark of the company. 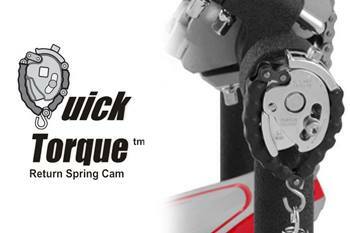 Ludwig’s emphatic reclaiming of his name, yet with proper marketing savvy, would contradict. Yet, almost all historical accounts mark the blue label badge as the first “Ludwig” badge after the reclaiming of the Ludwig name in 1955.